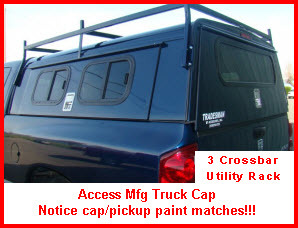 Access Manufacturing truck caps are custom made to your specification. 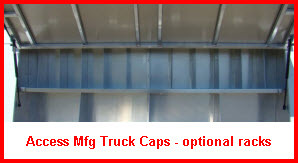 Access Manufacturing Truck Caps are designed around the Heavy Duty Aluminum Build Tradesman Camper Shell. Each cap is custom built to the customers specification. The company has been family owned and operated since 1972 and several of the employees have been in metal fabrication for a lot longer than that! The company is a national manufacturer of Electric Vehicle Utility Tops and sells to the general public from their company store in Winters, California. Access Manufacturing has customers in the contracting, service and recreational businesses using their aluminum truck caps for pickups, commercial vehicles, golf carts, electric vehicles and utility beds. In fact the company provides a solution for almost any trade or recreational use you can think of, including making custom aluminum truck canopies for the military version of the Hummer Trailer. Access Mfg. uses thicker sidewalls, tubing and roofs than most of its competitors allowing the company to offer a full 3 year warranty including the framework, exterior sheeting, hardware, paint, electrical, carpet, doors, windows and seals. Every truck or vehicle topper is made with high grade, heavy duty aluminum and all the functional hardware is heavy duty commercial grade. Every joint in the frame is TIG welded for a superior weld and the strongest and most squeak free truck cap you can get. Style wise you can pick cap configurations like cabover, wedge and sleeper so you get a cap that fits the way you need to use the vehicle. But that's not all … Here's a bunch of the options and accessories you can use to cook up the Access Manufacturing truck caps that's an exact match for not just what you need, but what you've always wanted. Moisture in the form of spills, water or oil/gas from shoes and boots, dirt and mud from your boots and offroading can sneak in between your car mats and carpeting, and almost permanently reside on your truck bed floor. Reduce the moisture, dirt and resultant mold and mildew problems by using universal absorbent floor mats. These mats are easy to use, protect your Access Manufacturing Truck Caps investment, and cleanup easily and quickly.